Alter The Press! 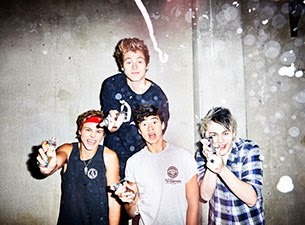 : 5 Seconds Of Summer Release Live Acoustic Version of "Out Of My Limit"
5 Seconds Of Summer Release Live Acoustic Version of "Out Of My Limit"
5 Seconds of Summer have released a video of the band performing a stripped down version of their 2012 single "Out Of My Limit," which can be viewed below. The video was shot at the Aussie pop-rock quartet's "Derp Con" convention that was held in Los Angeles back in November 2014.